High blood pressure symptoms are rarely noticeable but if they do show they can be mistaken for less serious health conditions. If symptoms do occur, a person may experience shortness of breath, headaches, chest pain and dizziness. Left untreated, high blood pressure can lead to serious health problems, such as a heart attack. A variety of symptoms may be indirectly related to, but not always caused by, high blood pressure. One is linked to the eyes. According to the American Heart Association, blood spots in the eyes can be an indicator. 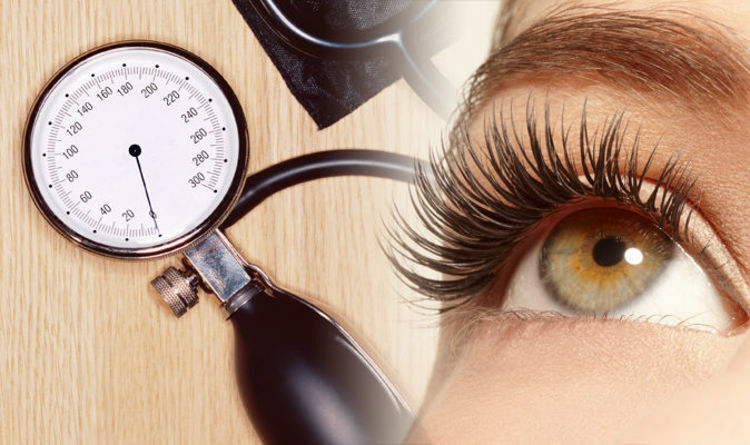 It explains: “Blood spots in the eyes (subconjunctival hermorrhage) are more common in people with diabetes or high blood pressure, but neither condition causes the blood spots. The eyes can reveal a host of different health problems, another being vitamin B12 deficiency. Vitamin B12 is an important B vitamin, important for many processes in the body. Not getting enough is detrimental. But if it’s in short supply in the body this can trigger symptoms of anaemia and lead to heart and lung problems. There are three symptoms which could point to a vitamin B12 deficiency that are evident in the eyes. People with a vitamin B12 deficiency can look pale or have a slight yellow tinge to their skin and the white of their eyes. This is known as jaundice. According to a study titled ‘Megaloblastic Anemias: Nutritional and Other Causes’ jaundice happens when a lack of B12 causes problems with the body’s red blood cell production. If you don’t have as many red blood cells circulating around the body, your skin can appear pale in colour. Fragility of cells also means they can break down, resulting in excess bilirubin. Bilirubin is a red or brown-coloured substance which is produced by the liver when it breaks down old blood cells, and large amounts can cause a yellow tinge. According to a study in Neurology India, eye twitching is linked to vitamin B12 deficiency. Similarly, magnesium plays an essential role in the functioning of cells, tissues and organs throughout the body, so eyelid spasms may also be linked to magnesium deficiency. The study did mention that further research would need to be carried out to be sure this is a symptoms of vitamin B12 deficiency. Blurred vision can occur when untreated B12 deficiency causes nervous system damage to the optic nerve that leads to your eyes. This was found in a study titled ‘B12 deficiency with neurological manifestations in the absence of anaemia’. Optic neuropathy is the correct medical term for this condition. While the can be alarming, experts advise it is reversible by supplementing B12. So how can you avoid a vitamin B12 deficiency? Yes, Mary Poppins Returns Has Lin-Manuel Miranda Rapping I’m A Celebrity 2018: Nick Knowles enters betting for CHRISTMAS NUMBER ONE - can he do it?